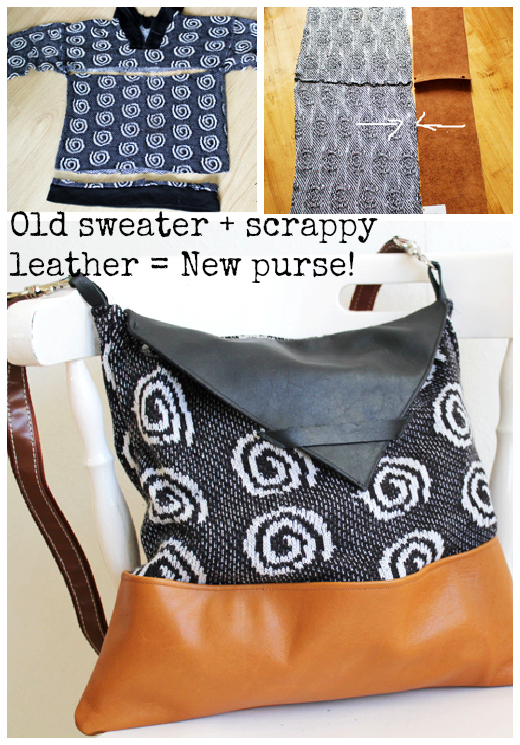 Upcycle: Bye bye sweater, hello purse! I'm beginning to threaten my sweaters (ok, all my winter clothes) with imminent donation... because muttering dark thoughts in the direction of my closet is a good outlet right now. And I need an outlet because I'm deeply, desperately sick of winter (there's really nothing wrong with the damn clothes). It's the snow!! Three-hour commutes thanks to the timing of this month's snow storms are driving me nuts!!! Ok. Apologies. I'll go back to swearing at my closet. And send you to Lana Red ... who's put together an awesome tutorial for turning an old sweater into a bag! I think this would be a fun way to repurpose an old purse too. You need a strap, hardware and leather bits from somewhere. So why not chop up that bag your kid destroyed with a felt-tip marker?